As ShadeElaine said “it’s one of those things you wouldn’t believe if you didn’t see it”. It’s art. Not new. Not fake. Just amazing. You will never hear me complain about this insane socal rain in the same way again. 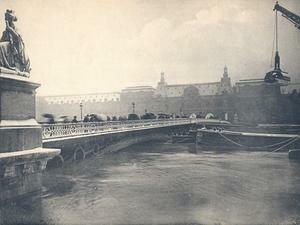 Here is Le Pont des Saints-Peres, during the Paris flood of 1910. The others you need to see, let yourself escape into, imagine what it must have been like to be there. Beautiful breathtaking surreal photography. For more.